Gap Analysis is a simple tool which is used by organizations to raise their performance level. Imagine you are hiking along a path when you come to a three-way junction. Which direction should you take? Well, that depends on where you want to get to. Armed with the knowledge of where you are going it becomes much easier to work out the necessary steps you’ll need to take to reach your final destination, including which of the three junctions to take right now. This simplistic explanation is the same basis upon which Gap Analysis works. 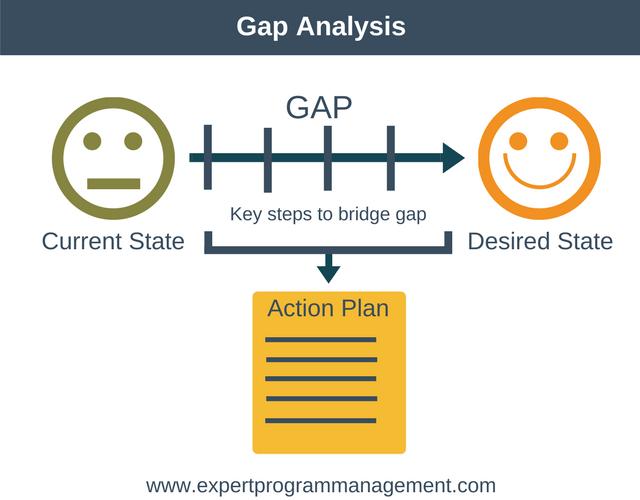 A Gap Analysis can help an organization to understand where they want to be, the gap between where their are now and where they want to be, and hence, what steps should be taken to close the gap. The concept of Gap Analysis is illustrated in the following diagram. As we can see from the diagram, to get from our current state to our desired state there will be a number of key steps we need to take to bridge the gap. From this we will create an action plan outlining the exact actions we’ll take to achieve each step so we eventually close the gap. Organization: for example, what skill sets or roles are missing or lacking? Business direction: for example, is their a gap in our product or a gap in the market we are not serving? Business Processes: for example, can how we do things be made more efficient? Technology: for example, are there systems we are missing, or are there incompatibilities between systems? In this step we describe the general area that we want to analyse and improve. This may seem like an unnecessary step, but by performing it, we not only highlight what general area is under investigation, but also what areas are not under investigation. This helps to avoid scope creep and keeps the rest of the analysis very focussed. For example, we might decide to analyse our online marketing efforts. This then implies that we are not investigating our offline advertising such as print and TV. By being very clear about what we are, and what we are not investigating, we keep everyone involved on the same page. In this step we identify specific areas for improvement within the general area described in step 1. For example, if the general area we are investigating is our online marketing, then we may identify content creation and paid advertising as specific areas we’d like to improve. Now that we have identified our specific improvement areas, the next step is to set targets for each area. A common input to this step (and the next step) is benchmarking, whereby a company will benchmark its performance in an area against its competitors performance in that same area. The results of this exercise will show areas of underperformance and these areas are then commonly chosen as the improvement areas for this step. Another commonly used input for this step is to analyse industry best practices. What targets are set will depend on a combination of the time available to address the gap as well as the ambition of the organization. Now that we understand where we want to get to, it is important to understand where we are before putting the action plan together. By understanding where we are it makes it more likely we’ll create a realistic action plan. It also makes it easier to see if we are making progress towards our desired state, because if we don’t know where we started then it’s very difficult to measure progress towards our goal. The difference between step 4 and step 3 is our “gap”, that is, the gap between where we are and where we want to be. Now that we understand the gap, we use this final step to describe the improvement steps we will take to close the gap and get to where we want to be. In essence, this step is our action plan to get to where we want to be. The action plan should be prioritized so as to deliver the biggest return on investment. One way to do this is to prioritize the most critical gaps first, or to target low hanging gaps first. Let’s look at a simple example to bring this to life. For the purpose of this example suppose we work in an electronics company, and we are investigating the customer satisfaction of customers who return faulty equipment to us within warranty for repair. As you can see, we are concerned only with faulty goods returned within warranty. If we weren’t explicit in stating the area under investigation then it’s possible that confusion could be created amongst our peers’ understanding of the scope of our Gap Analysis. Customer Satisfaction Rate: The percentage of customers that are satisfied with the service they receive. Repair Time: The total time it takes to repair the faulty product and return it to the customer. In this step we determine targets for the specific areas we’ve identified above. To determine target values for these metrics the company decides to benchmark its best competitors. From doing this it determines that to compete with the best in the industry it should be aiming for a Customer Satisfaction Rate of 99% and a Repair Time of 12 days, and it decides to choose these values as its targets for these areas. We have reached the final step, where the company describes the actions it will take to close the gap between the Current State and the Desired State. Because the company has no data for Customer Satisfaction Rate it decides the first step is going to be to benchmark the current situation, and then review the findings of this analysis. To improve the Repair Time metric and get it to 12 days the company decides to implement a new repair system and train its staff how to use it. Through the completion of its Gap Analysis the company has clearly articulated the exact metrics it wishes to improve and by how much. It has understood exactly where it stands now for each of those metrics, and it has created a solid action plan to address the gap between the current state of each metric and the desired state. You can download the template that we used for the example above here. 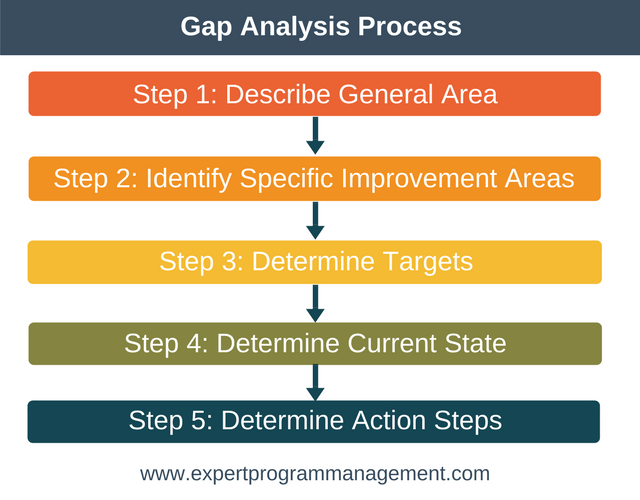 A Gap Analysis is a simple tool which is used by organizations to raise their performance level. 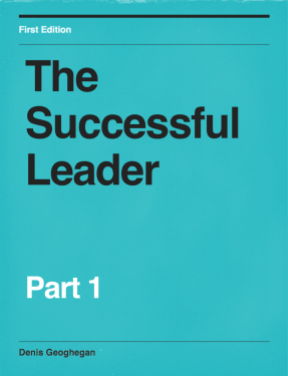 It can help an organization identify where they want to get to, where they are now, and create a plan detailing how to get there.